Like most of our colleagues in the wedding industry, the last few months have been absolutely manic for us. Looking back at our diary this morning I realised that we’ve not had a wedding free week since early MAY. Every day of every week for the last 5 and a bit months has been accounted for. And even prior to that we had the weddings of weeks prior to edit and deliver. No wonder we’re feeling a little frazzled! As the commotion of hitting the road and actually shooting every weekend begins to wind down, we find ourselves housebound most days, stuck in the editing cave. We have been dedicating a bit more time to non-work pursuits though when the opportunity arises. We’ve tried a few new things, shared our skills and even ticked off some bucket list items. You might remember a post from last month about us volunteering for Wallace Kennels. 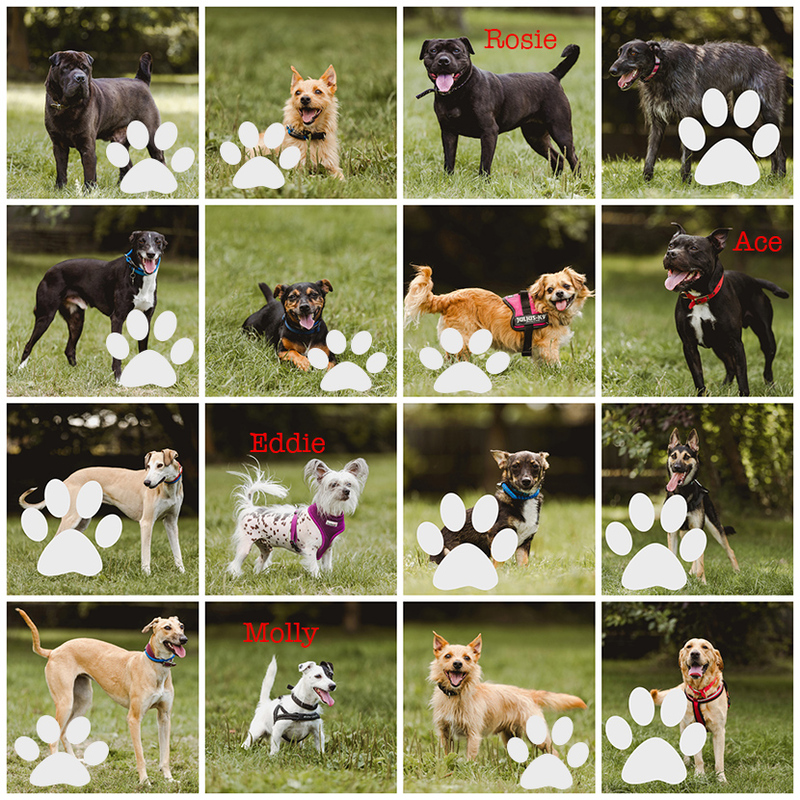 We went to visit and photograph some of their dogs who were looking for new homes. If you missed it, you can find that post here. We’re pleased to say that since photographing these gorgeous dogs, several of them have found new homes. In a way it’s sad that it takes fancy looking professional photos to “sell” a dog, but we’re so glad that we were able to help some of them in some small way by helping them find a home. New dogs are coming in all the time though and some of the original dogs, through no fault of their own are still looking for homes. So if you’re looking to introduce a furry friend into your home, please consider rescuing. And do check out some of the residents at Wallace Kennels. We have also volunteered some time to help Tower Hill stables and animal sanctuary. A vegan animal sanctuary in Essex that has been saving animals for more than 20 years. They have just moved to the most incredible new space with magnificent views across the water. “River Field” is available for wedding and event hire, on a dry hire basis. They provide the gorgeous setting for FREE in return for a donation to the sanctuary! A totally DIY wedding that allows you to build your perfect day and help support animals in need in the process. You can’t really get much better than that can you! A wedding with the feel good factor. If you’d like any more information about this wonderful place, you can find their facebook page here. As soon as the opportunity arises (ie when we get a nice day where we also happen to have a “day off”) we will be returning to take some photographs for them of the area. So watch this space! A while ago we also launched our mentoring service. This is something we had wanted to do for a while. Louise walked away from a job working with special needs children to pursue photography full time back in 2012 and has missed the teaching element and supportive role ever since. At the time we launched we’d been shooting weddings for several years and we wanted to help other photographers learn from our mistakes. We wanted to share our knowledge and help other photographers to set and achieve their professional goals. After an initially positive start we got so busy with weddings again that we just didn’t have the time required to dedicate to any more mentor-ees. Then we moved house. So for a good year, mentoring was put on the back burner as time was in short supply. Isn’t it always!? This year though I decided that actually, this is something that was really important to me. So time was made. Time that would have otherwise been a day off or an evening off perhaps, but the time was there so it was used for something important to me. And i’m pleased to say that over the last month or so i’ve been able to get stuck in with a fantastic new photographer who I just love chatting with. She’s so full of energy and passion and I cannot wait to see how her journey progresses over the coming months and years. And most recently- in fact, just yesterday evening we had a bit of a bucket list moment. Not that either of us actually have a bucket list, but still. 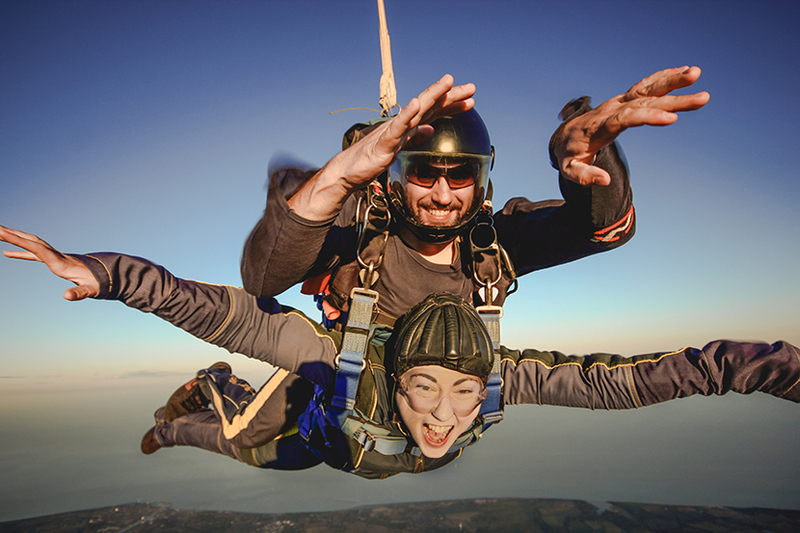 We did a tandem skydive! After years of saying i’d like to do one and after doing an indoor skydive back in July, we came home and spontaneously booked the real deal. It’s one of those things that never felt like it was *really* going to happen. But it crept up out of nowhere and yesterday was the day. 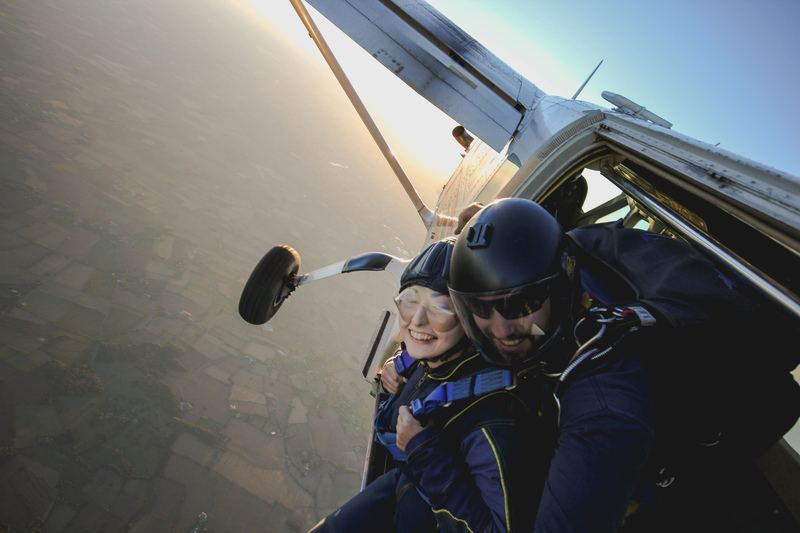 We’d opted for a sunset skydive over Beccles, allowing us to see the beautiful Suffolk/Norfolk coastline from around 15,000ft above ground. As it happened, we’d chosen a spectacular night for it as the sunset yesterday evening was something else. By far the best sunset that we have seen in a while. It was a surreal experience. Nothing about any of it felt like how i’d expected it to feel. You expect to feel nervous, apprehensive, to have lots of intense training. I expected that heart in throat feeling of falling. But it wasn’t like that at all. It was just excitement. From the moment we arrived it was quite a well orchestrated series of things to do and before we knew it we were walking away at the other end with a certificate and a “did that just happen” feeling of wonderment. The thing I was most surprised about was the training. For some reason, i’d half expected for us to have to arrive at 6 in the morning and go through a military style training procedure all day. As it happens, we arrived at 5pm, checked in, put on a jumpsuit, hat and goggles and had a very quick briefing about the moment of exiting the plane and that was it! Being on the other side of the camera was an experience I’d not be overly keen to repeat. We chose to have it filmed and photographed- we’ll share those as soon as we have the footage. Now we know how our couples feel, ha! The plane ride up there was the longest part of the process, taking around 15 minutes to reach the correct altitude. Once we were there it was very much boom, boom boom. The door was opened and instantly people began leaping from the plane. Some backwards, in t-shirts! It’s a far more casual experience than you’d expect. Which was actually very reassuring. Before I knew it, i’d seen Sam tumble from the plane. I’d imagined him to be screaming his lungs out and apparently he was, but I didn’t hear him at all. Then it was my turn and I was at the door. I remember it being so loud and marvelling at the view below. It was beautiful. 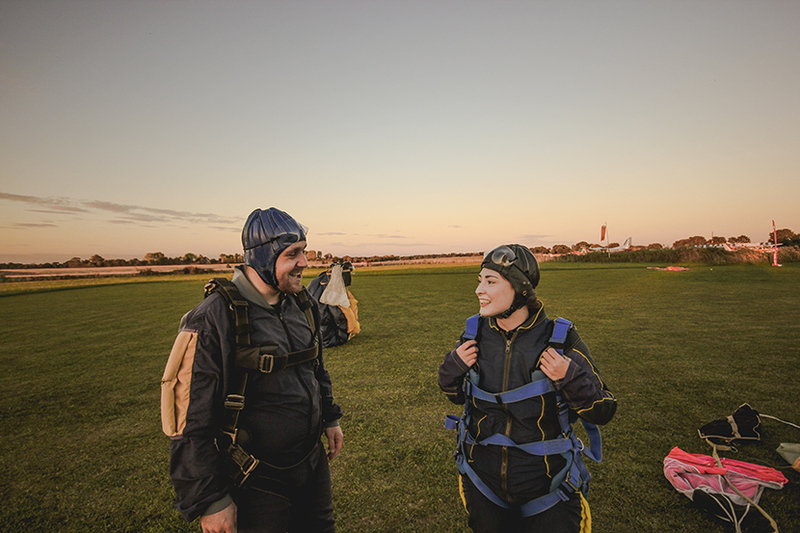 I was so in awe of it all that I didn’t hear my instructor tell me to put my legs outside the plane at all, I was too busy just watching the ground below! Then I snapped out of whatever trance I was in, gave a smile and wave to the camera and suddenly we were flying through the sky. Not literally flying, more just falling. It felt like it took my eyes and body a few seconds to adjust to it all and process what was actually happening. 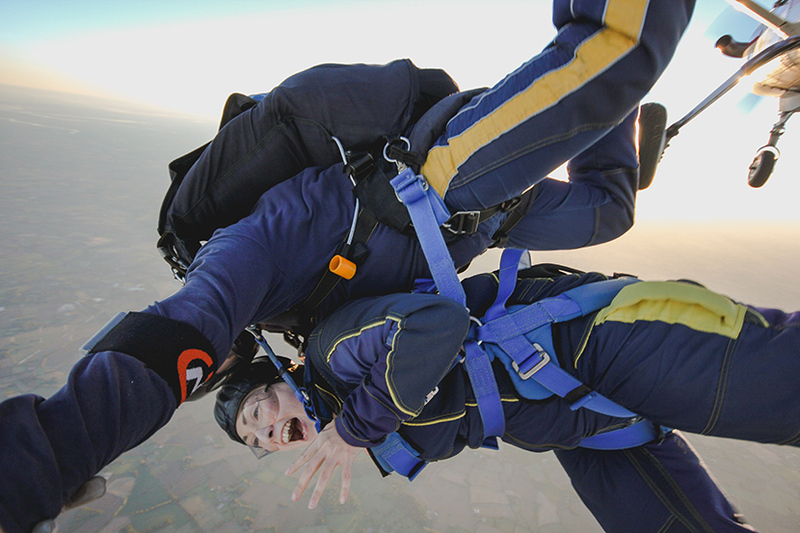 Then we levelled out into the classic skydive “pose”. It was the strangest feeling. Not like falling at all. It didn’t ever feel like falling. More like floating with wind soaring past you really. Then the cord was pulled and all of a sudden we were thrust back up into the air, as if plucked from above. I wasn’t expecting that bit. From there we just floated through the air, blown away by the views and the sunset. It was so much to take in, it was just amazing. I don’t think I closed my mouth the entire time! My jaw literally dropped and I couldn’t pick it up. We had a few spins of the parachute too and I had a go at controlling it myself which was good fun. My harness was a little tight so we didn’t get to mess about as much as i’d like…maybe next time. There will definitely be a next time! 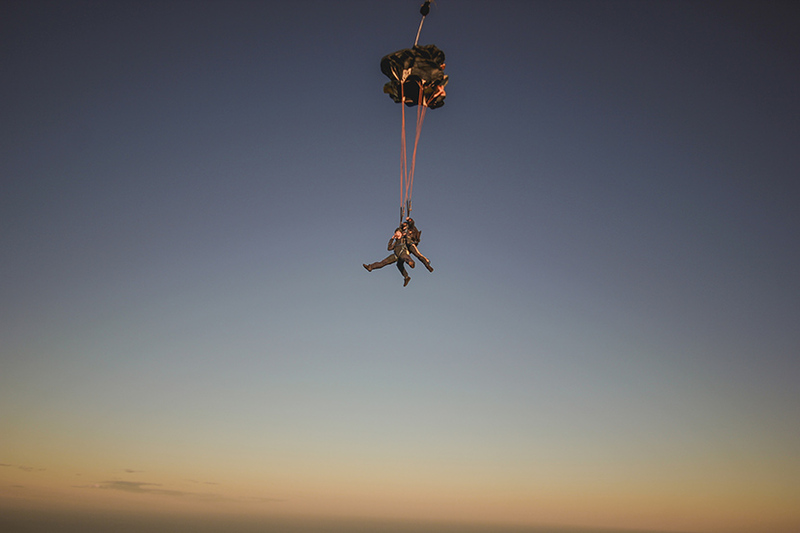 Although we did the jump “just because” we thought it would also be a good opportunity to raise some money for charity. 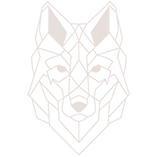 We decided to support Cruelty free international who are a charity that aim to stop animal testing. If you would like to donate, even if it’s just a pound or two, we would be incredibly grateful. You can read more about the charity on our just giving page linked above if you’d like.